Ahead of the Brazilian Grand Prix this weekend, all eyes are on Felipe Massa. It’s understandable, but what should have been a rousing reception has instead become an awkward acceptance of the inevitable. Massa has visited the podium only twice this year, including at Monza, where he declared he was “too old for this”, having beaten his teammate Valtteri Bottas by less than three-tenths of a second. He finds himself nine points behind his junior teammate, despite a respectable record this season with a string of fourth, fifth and sixth-place finishes – a vast improvement on 2014, where he was still finding his way at Williams. 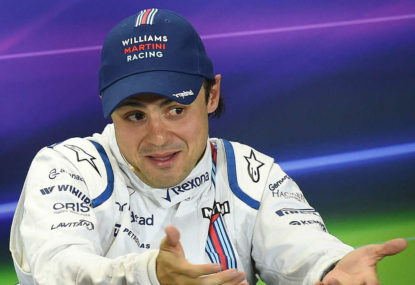 “Next year will be the last on my contract, so I think that will be the most important season to understand if I continue or not,” Massa said last week. It brings to mind an interview in 2013, when he was asked about his future in Formula One. After Ferrari announced that he would be replaced, he was asked what he would do if he could not find a seat with a “front running” team. He sheepishly waved ‘bye-bye’ to the cameras, partly to diffuse the tension inherent in the question, and perhaps because the harsh reality of his predicament hadn’t truly registered with him. By his own admission, Massa is a driver who needs to “feel loved”, which might explain why he hasn’t been a title contender since he enjoyed the unquestioning adoration of the Tifosi, and lost his mojo when usurped as top dog by Fernando Alonso. Not only has Massa not threatened to win the championship since 2008, he hasn’t even won a race since then. He’s currently sitting on 11 career victories, the same number as Rubens Barrichello. The tallies of Brazilian heroes Nelson Piquet (23 wins) and Ayrton Senna (41 wins) illustrate the dominance of those who came before, and Massa doesn’t look like he’ll be adding any more notches to his bedpost any time soon. Brazil has produced some of the greatest Formula One drivers ever, however Massa will join Barrichello on the sidelines of greatness, a has-been if indeed he ever was. In his home country, Barrichello is seen as a joke, a talent that simply didn’t stack up due to a combination of being number two to Michael Schumacher and some fairly unrealistic national expectations. Where Australia embraced Mark Webber as a fair and fierce competitor who did the best he could under difficult circumstances, Barrichello was seen as the driver who made compromises to further his career without ever believing he could be the best. Perhaps the baton has been passed to Massa’s countryman and namesake Felipe Nasr, who hasn’t done too badly in a car that looks like it’s sponsored by Ikea and handles like it was assembled there. Brazil’s passion for Formula One has continued unabated and will continue long after the next Brazilian superstar has caught fire, whomever it may be. As for whom that will be, your guess is as good as mine.